What if I tell you there is a way you can start to make money by simply designing t-shirts will you believe? If you’ve gone on the internet for a while, you might notice some ads talking about selling t-shirts with designs online. You might get interested but you have the doubts on how you are going to do this on your own. 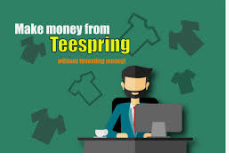 The good news is that inside this video and audio series is a bundle of step-by-step course that will give you the wisdom of starting your own Tee Shirt Business within minutes. With this business, you will create your own economy and start making money while you sleep. Give it a try now and you won't regret it.